Time. It's what we don't have alot of control over in our sunny, as-good-as-full-employment island. But it's also what our children craves from us. Unfortunately, this sneaky little thing called time absolutely flies. I guess sometimes, we just have to put our work down and say, it's about time. 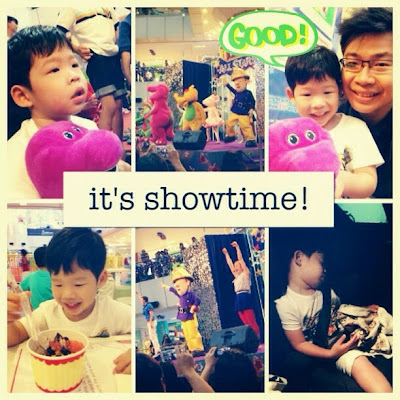 It's about time to go home and see your child (not over Facetime), about time to teach your child how to read (not using the iPad), about time to do silly things like get excited over Barney and the Teletubbies (again). Er... it's also about time the Teletubbies upgraded their CRT tummies to LEDs??? Manly stuff - steak, cars, sleep. And icecream. And colouring. And selfies. Teletubbies still look the same after almost 20 years. Same old CRT technology. December is a time when we reflect upon the year that was, and I'm glad I made the conscious effort in the past two months to spend as much time with Aiden alone as possible. With the addition of Ava to our family and Aiden having to share our time with his sister, every little moment I have with Aiden is both an opportunity to minimise his jealousy as well as a way to strengthen our daddy-and-son bond. 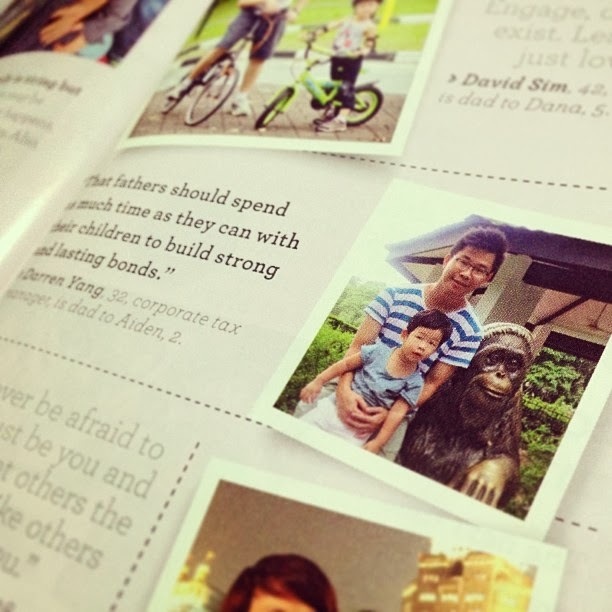 December also saw my two-cents worth being published in the Mother & Baby Magazine, thanks to Kelvin Ang, a fellow daddy blogger at Cheekiemonkies (http://www.cheekiemonkie.net/). Can't believe Christmas is already over and 2014 is already upon us. I have not even gotten myself a new calendar for the office. I hope in December 2014, I can say that I have practised what I preached! 1) Have a cold drink! It is not so unbearable nowadays with the cooler weather setting in, but an ice cold drink is always welcome. As much as it may not be good for me, I do need this. Leaving this to the good hands of my hairstylist. Some me time & pretty feet to look at (now that I can see them again). Once given the go ahead by my gynae. Miss our weekly swims. Pray for good weather. This is another list I am making. I wonder why the cravings come now, after pregnancy. Some new clothes and christmas gifts. Online shopping meanwhile. Swim, gym and strolls with the baby. Have been contemplating to go during confinement. Can't wait to do so with our new family of four. With our boy. Any tips or recommendations on places to visit with a 3 year old in Australia? How he'd come over to my place, rain or shine, bringing me lovingly boiled bird's nest, helping with marketing for my confinement meals and running errands for me. How he'd walk towards baby's room and watch closely as she sleeps. Once she stirs, he'd gently pick her up and starts speaking to her. How his eyes lit up as he shares with us when she finally opens her eyes and looks into his. How pleased he is when she drinks contently as he bottle feeds and burps her. How contented he is, just to hold her in his arms, gently stroking her with his hands. Those arms which held me, and those hands, have weathered over the years. I may not remember but I am sure this is how my father sees me when I was a baby. In comparison to what he's done for our family, for me, I am really ashamed of myself. I am happy that bringing my two lovely kids into this world have brightened and enriched his life and how he is such a proud and doting grandfather today. I can't express how thankful I am to have him in my life and how lucky I am. 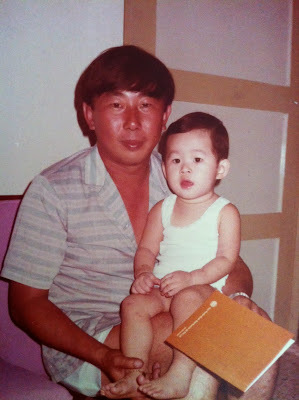 I love you so much Papa. 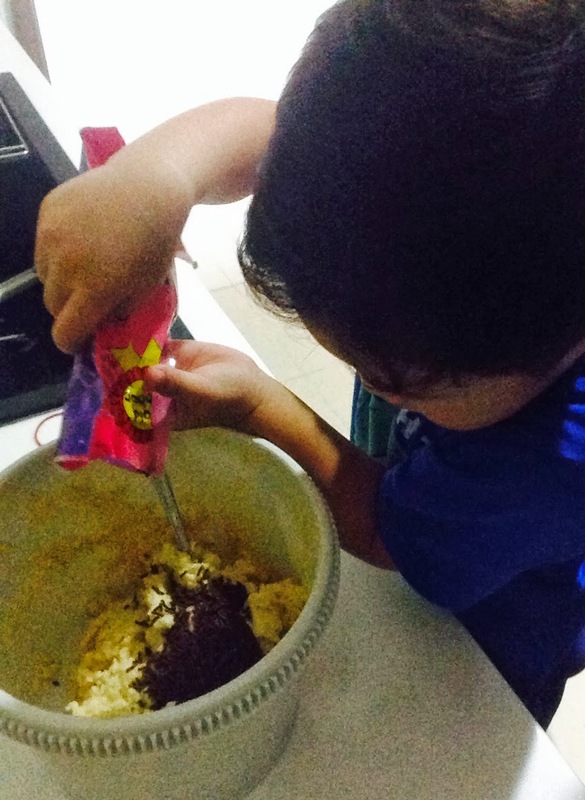 Baking with a two year old does have its challenges and yet I really look forward to baking with Aiden as it provides him with opportunities to display his creativity, allow him to get hands on with the ingredients & mixer, and learn about ingredients & measurements. 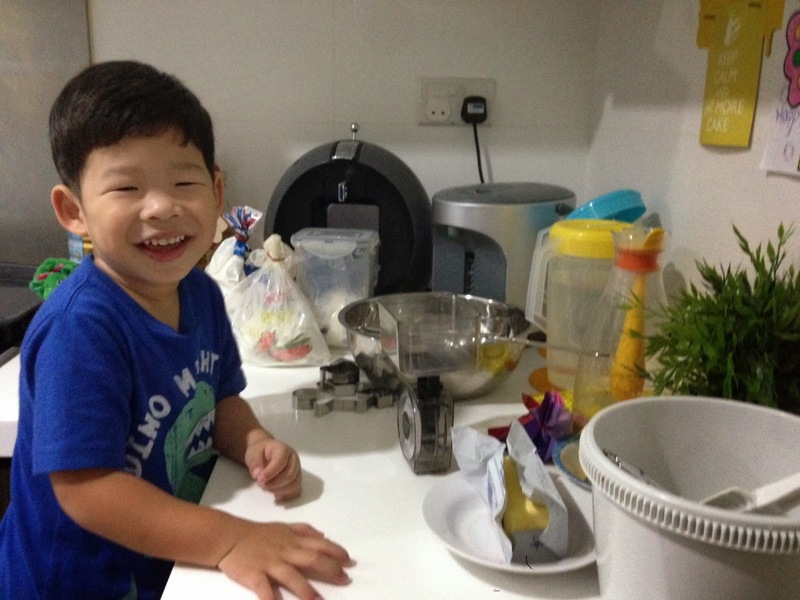 Although it will take a longer time and create a bigger mess in the kitchen, nothing beats seeing his wide smiles when he gets involved in the process and finally tasting his own creations. 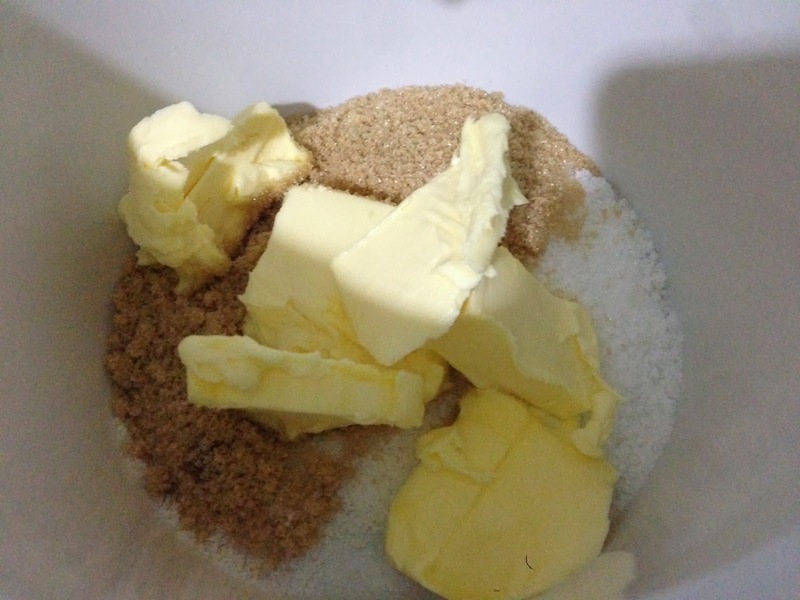 We have tried our hands at a few different cookie recipes and also a Betty Crocker's Muffin Mix. 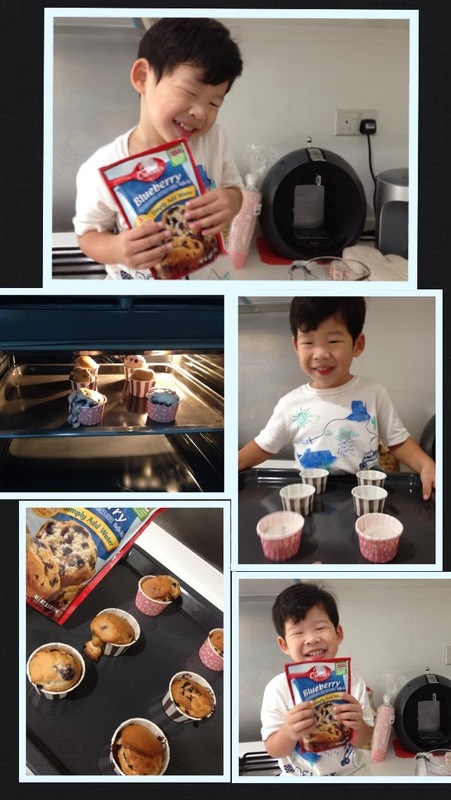 Here's Aiden having fun at baking the muffins. Totally fuss free and just takes minutes and a 2 year old to do it. We do not recommend this, as the taste of the blueberry mix is pretty artificial and it doesn't taste good. I am going to get my hands on the RedMan Golden Muffin Mix which are much yummier and bake away with Aiden after my confinement. Just add water, stir and spoon them into your muffin cases. Pop them into the oven and tadah! 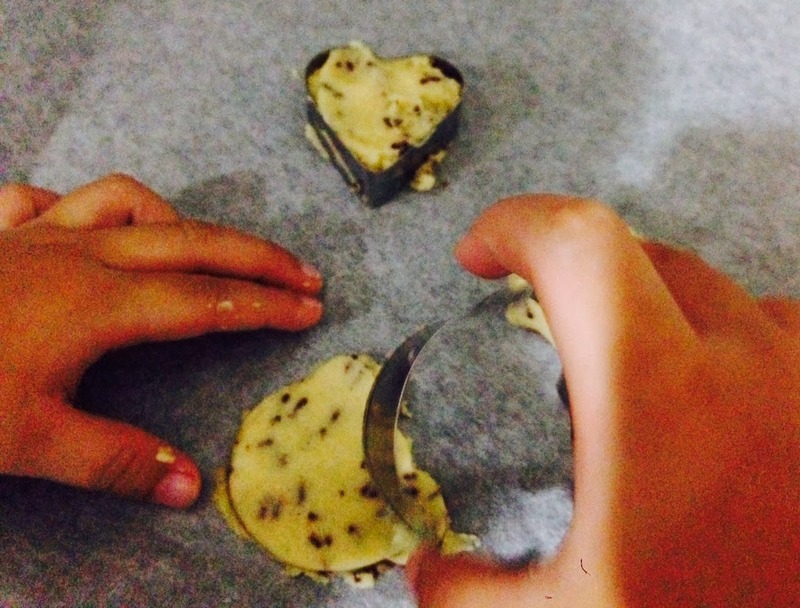 We would also like to share this simple cookie recipe that we both enjoy (baking & eating). First we lay out all the ingredients we need. I will read aloud the ingredients we need, and lay them out on the kitchen top. 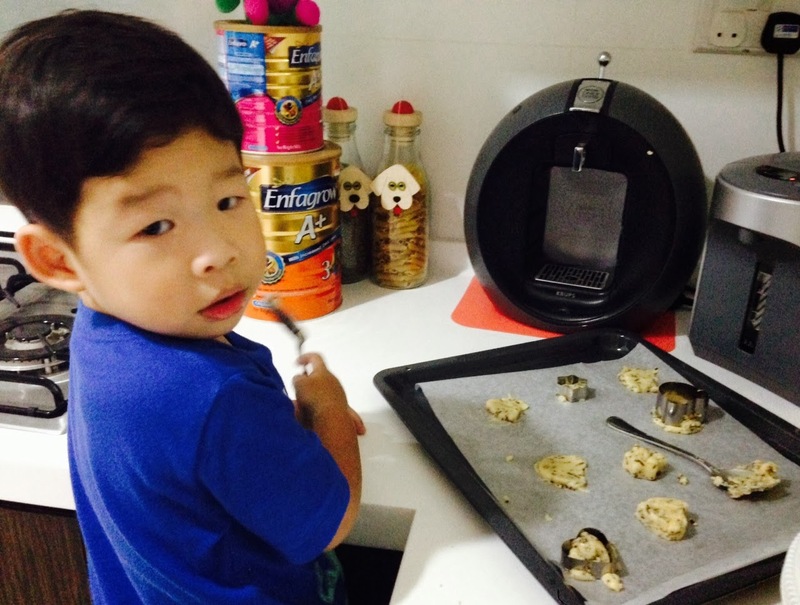 At our 3rd baking session, Aiden can shout out a few ingredients before me. 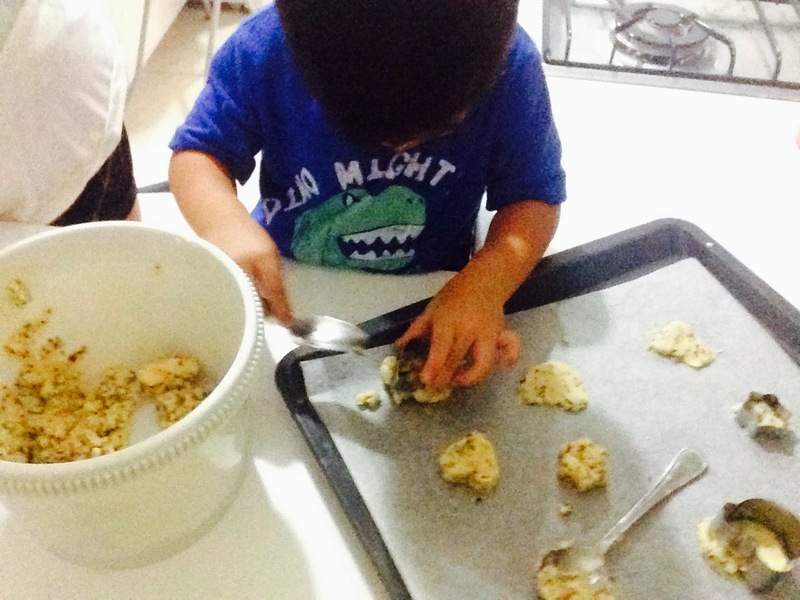 He also enjoys watching me measure out the flour and sugar, learning to read the scale. 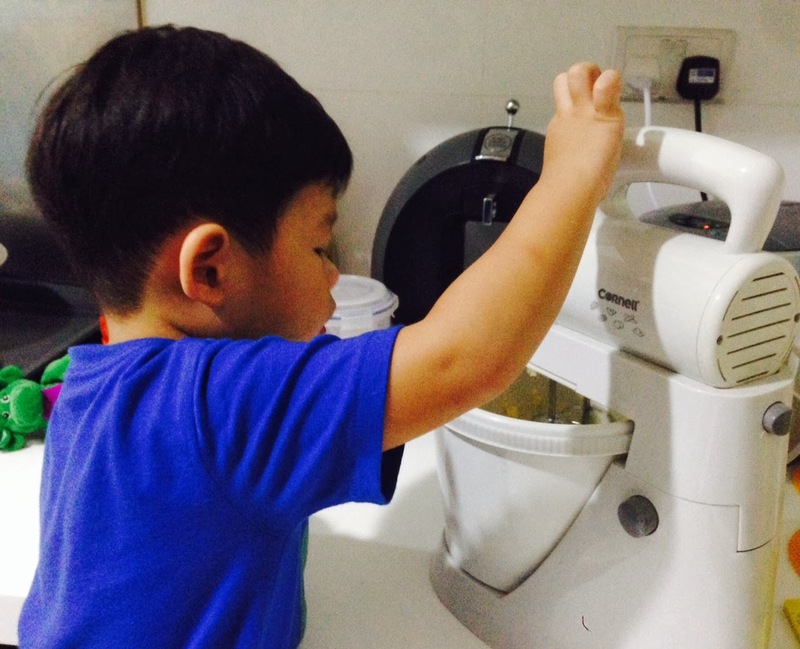 I let Aiden control the mixer, which he very much enjoys as he seldom gets his hands on the electrical appliances at home. We are done! 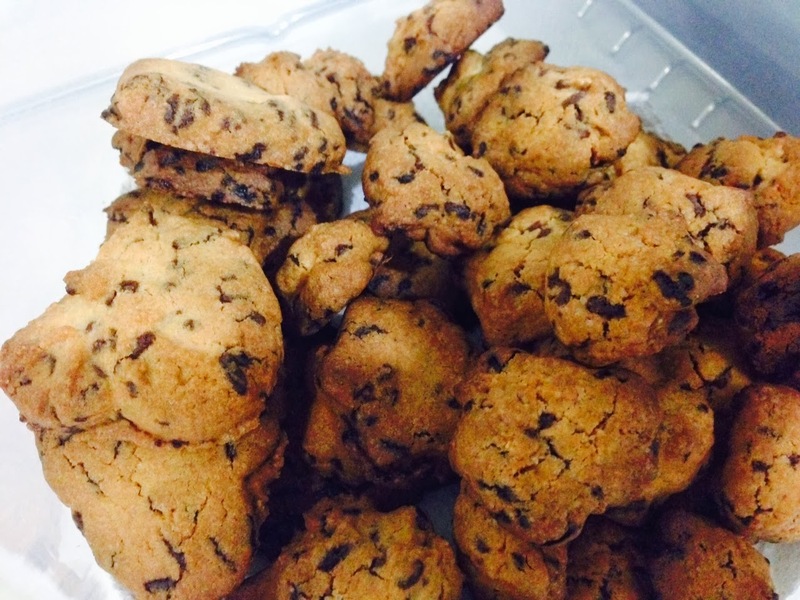 Yummy cookies. 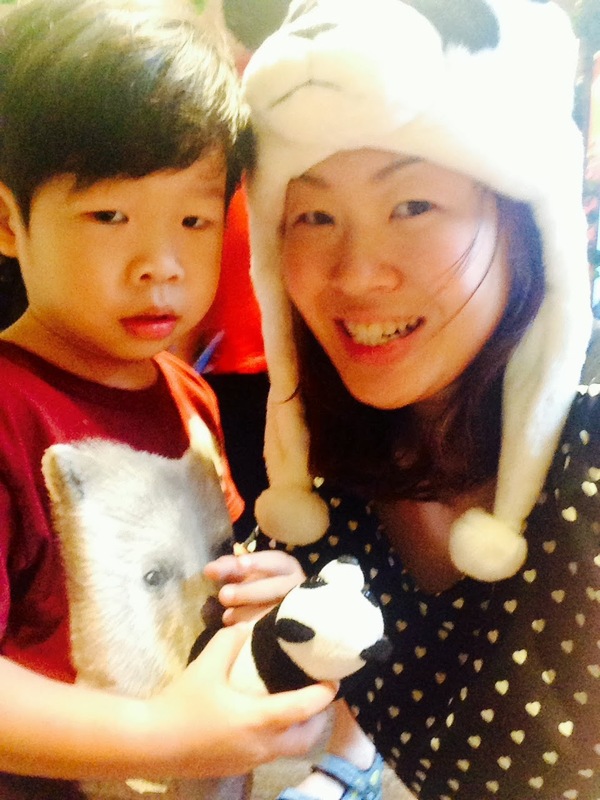 With my dad & Aiden, we paid Kai Kai & Jia Jia a visit at River Safari Singapore in October. There was much hype about this relatively new attraction in Singapore, being Asia's first river-themed wildlife park and here's our review. 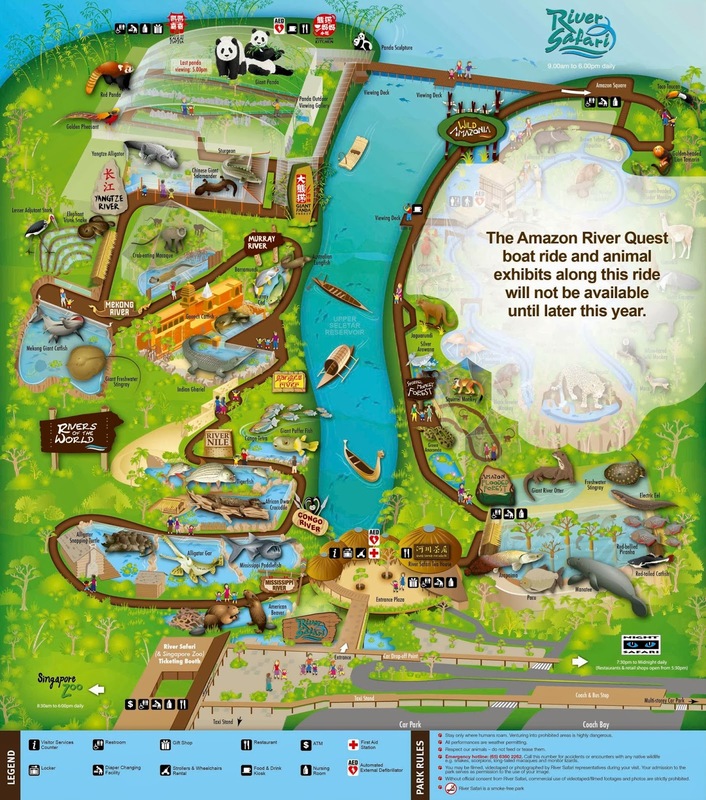 Rivers of the World which features wildlife species, fishes and aquatic life from 7 rivers, Wild Amazonia which features the Amazon River Quest (scheduled to open this year end) & Squirrel Monkey Forest and the highlight of the attraction, Giant Panda Forest. We went with a stroller and the park was friendly enough for us to go everywhere with the stroller & the exhibits were well laid out for our discovery and exploration. Ideal for families with young kids. Most of the signages were very attractive and simple to read, with some interactive signages with sound effects, good for independent discovery for kids. At the beginning of each river, there will be a unique signage sharing interesting facts about each river & the species found in each, a great teaching tool for parents with kids. Each visitor is restricted to 15 minutes in this area, and reminded to keep very quiet. 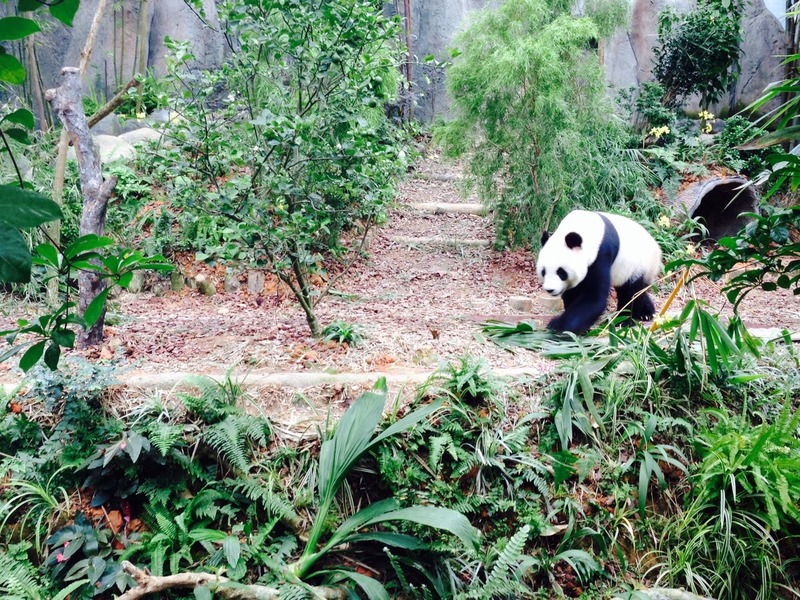 We were lucky to catch more than a glimpse of both Kai Kai and Jia Jia as both of them were in action. The air conditioned enclosure is a welcome escape from the humidity outside. Look at my paw mummy! 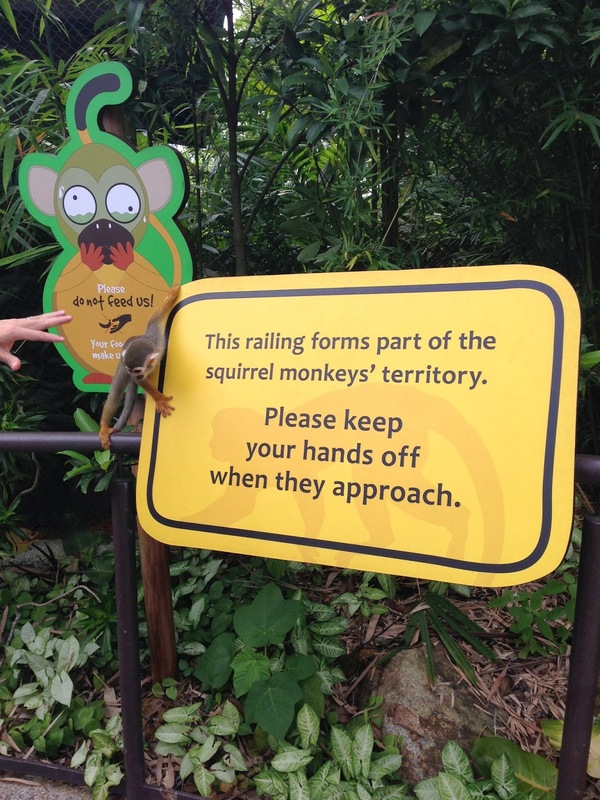 Aiden's favourite memory of the River Safari has to be this Squirrel Monkey Forest. The very sociable monkeys were free to swing around and came very close to the visitors. One mischievous monkey even jumped onto a stroller, scaring the parents of the young child. The squirrel monkey is the most abundant monkey species of the Amazon rainforest, observe how they leap from tree to tree hunting for fruits and insects and hear them call out to the rest of their troop. We took about 2 hours to complete exploring the River Safari, and did not think it was very worth visiting compared to the Singapore Zoo or the SEA Aquarium. Lastly, a tip would be to bring your own water and snacks as the dining options are pretty limited. 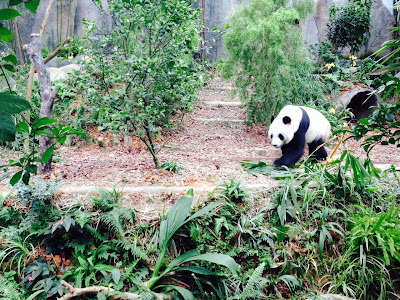 The Mama Panda Kitchen can be very packed, unless you would like to try the much hyped panda buns, or the River Safari Tea House located near the entrance for local food. There are also kiosks along the way selling drinks and snacks at exorbitant prices. 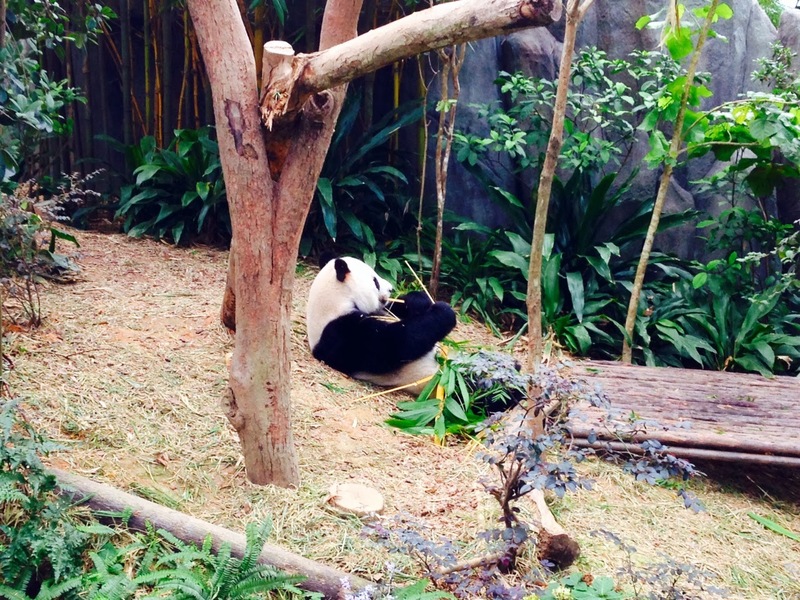 You can either self drive or get there via pubic transport, carpark is the same as the Singapore Zoo. 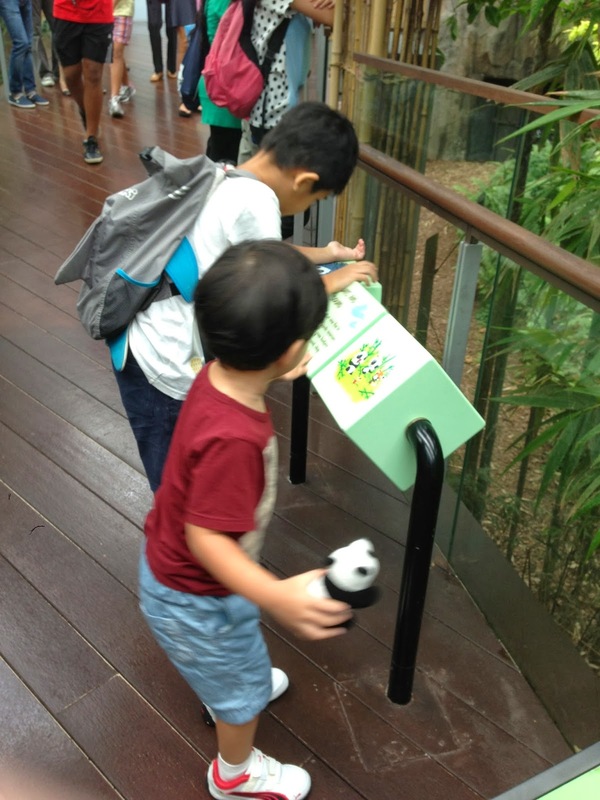 The entrance is at the same location as the zoo, on the other side of the ticketing booth. 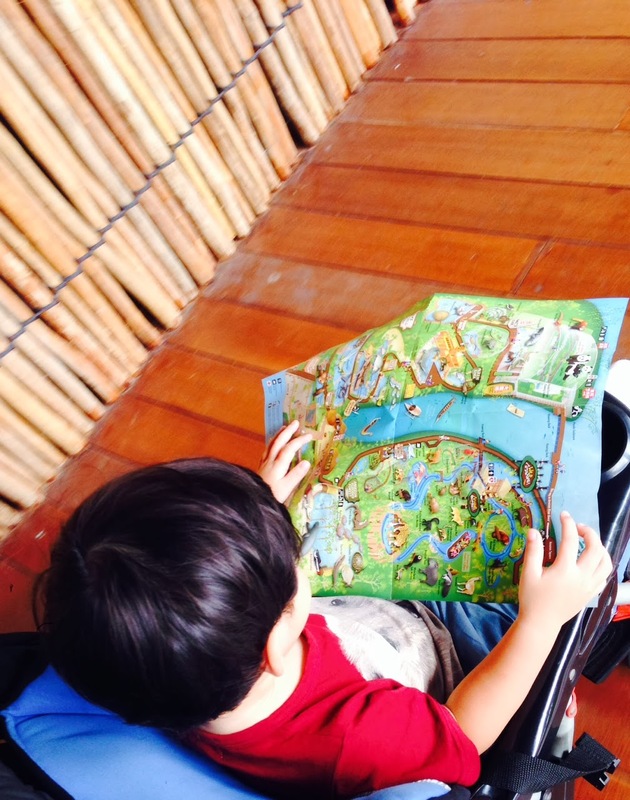 Or save more by purchasing the Park Hoppers including entry tickets to the Zoo, Night Safari, Bird Park and River Safari. A week since we became parents to our baby girl, Ava and I am slowly embracing this new status - Mummy of two. It got pretty emotional for me having to focus on Ava, and trying not to neglect Aiden. 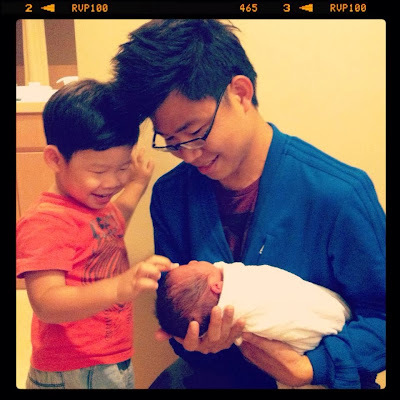 I felt guilty as I bond with Ava, as I can't spend time with Aiden. I hope this will pass quickly as soon as I am out of confinement and feel stronger physically to give my best to the both of them. Can't wait to celebrate our new family and counting down to the end of confinement in 20 days! Between breastfeeding and pointing my phone & camera at Ava, I am trying to get more rest, catch up on my blog posts and squeeze more quality time with Aiden & Daddy Darren. Crafting with my dear son, Aiden. Happy to see the smile on his face. 'Children needs your presence, not your presents'. November has been a difficult month for me (as you can tell with the lack of blog posts). 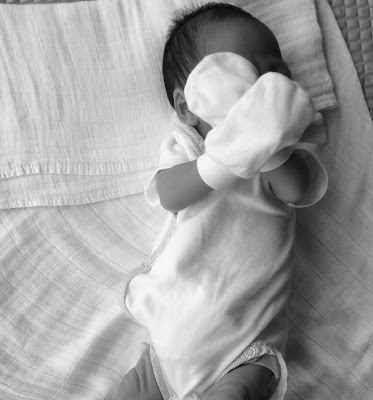 It is the busiest month at work, and it was also the last month for us to get ready for our second child, Ava, who was scheduled to arrive via c-section on 3 December. The latter is in past tense, because our baby girl sprang a surprise on us at 36 weeks, just like her brother Aiden, who decided to come out at 35 weeks plus back in 2011! If early signs (pun intended) are anything to go by, they should get along pretty well. Aiden on the left, Ava on the right. 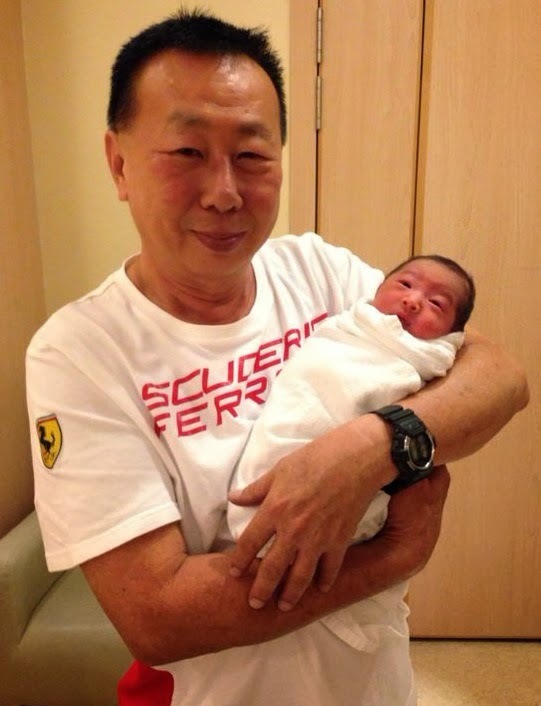 Look how similar they looked at birth! 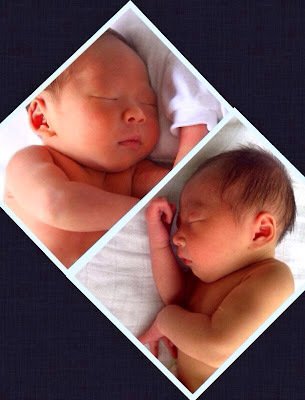 Unfortunately, they also share jaundice, tongue tie and low birth weight between the two of them. A quick visit to a clinic settled the tongue tie, and now it's up to Mummy Cher's breast milk and the sun to fix the rest. Seeing how Aiden has grown since 2011 really helped to put me at ease the second time around. Unlike the first time when I was constantly worried, I am confident that things will be ok for Ava in time to come. I was so happy to see Aiden gently stroking Ava's head. I am also glad that all the prepping which started months ago helped Aiden to settle into his role as a brother and protector of his baby sister pretty quickly. We will share our personal experience/tips on how to prepare your first born for a newborn in time to come (we need to make sure it really works!). Even with all the similarities between brother and sister, it is also already apparent how different Aiden is compared to Ava. 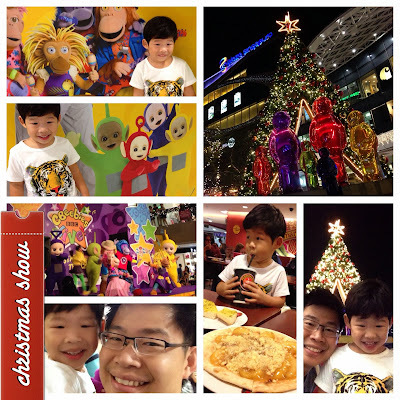 From their cries, I (and our neighbors) could tell that Aiden is the gentle giant, whereas Ava is the chilli padi. From their feeding habits, I could tell that Aiden is the "eat-all-you-can" type, whereas Ava is the "fine-dining" type. You know, a small bite here and there, and some conversation (or cries) in between. I have a feeling we can't use the exact same parenting methods that we used on Aiden this time around. One thing's for sure though, life will never be the same again (and again) with Ava joining our family. Looking forward to it! We took this precious family photo a few days before Ava joined us! How glad I am to have Monday off as my office is closed for Deepavali PH today. 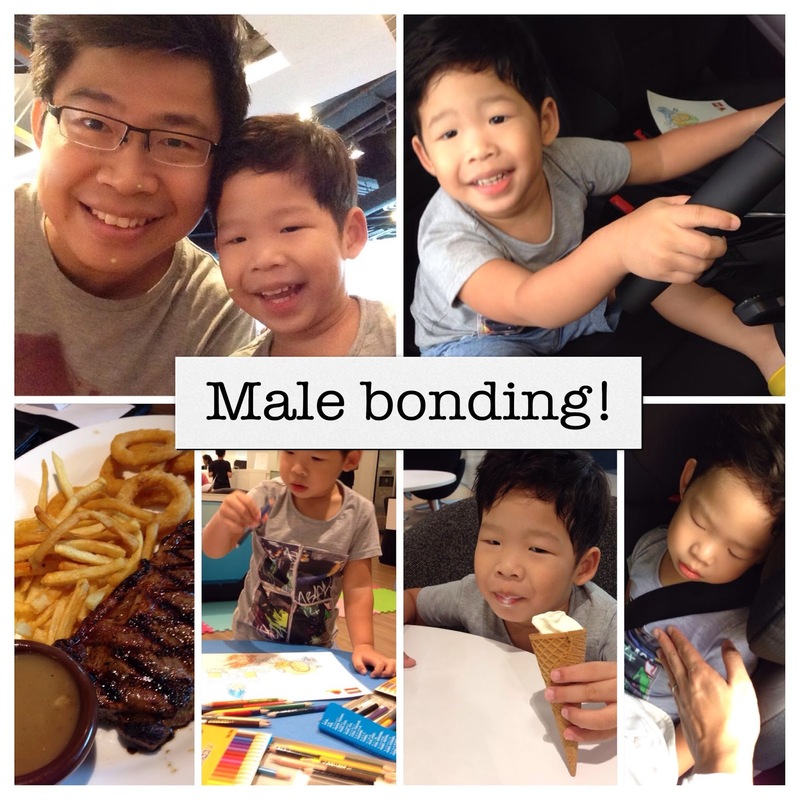 Taking the chance to spend some quality time with my boy and mum as we hardly went out together, we headed to the malls as it started to rain. 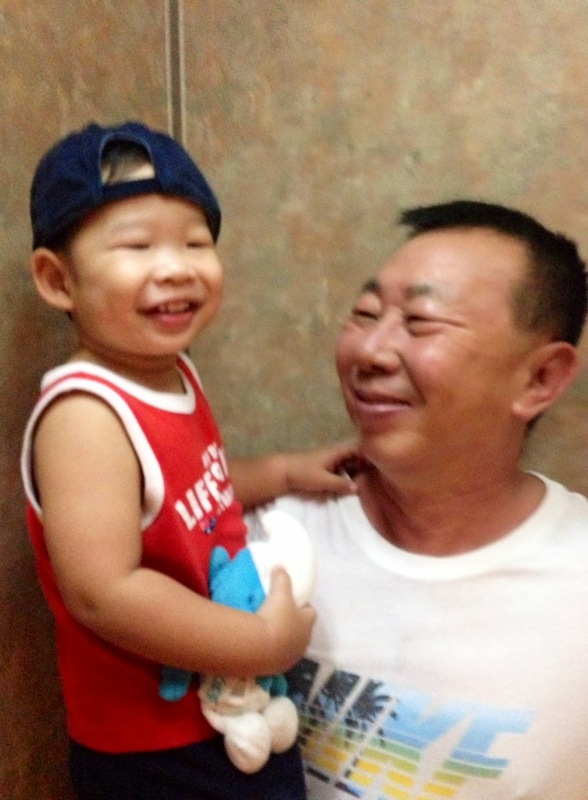 And Aiden was a happy boy as long as he doesn't have to attend school! Shopping for both of them makes me happy. At 34 weeks pregnant, there isn't much I can fit into, nor do I want to spend more on maternity wear - hoping to breastfeed (and work out) my way to a trimmer me in time to come. 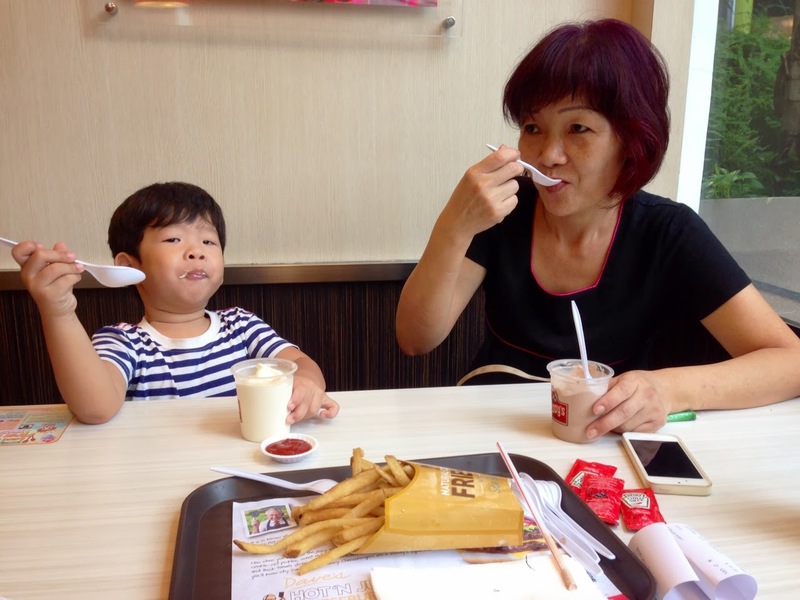 #1 - We went to Wendy's for a light bite & Aiden followed me to the order counter. He wanted to have ice cream and I ordered him a cup. I passed the cup to him to carry to our table and reminded him to be careful, and hold it upright. As we approached our seats, he had a fall and the ice cream spilled all over the floor. A group of diners gasped loudly, and gave us a 'OH DEAR, how could you let such a young kid carry his own food' look, almost like this was expected. 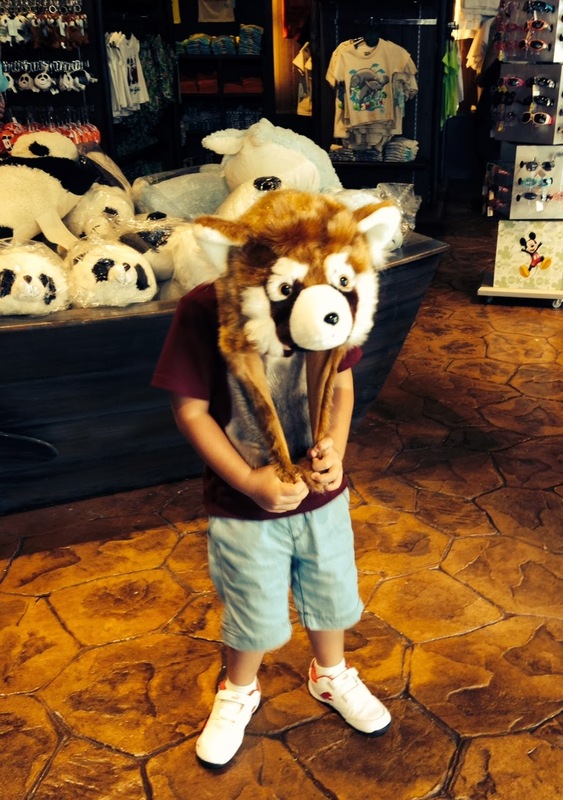 Aiden got up quickly and hid behind a chair nearby, lowering his head. I wasn't angry at all with him, and just wanted to make sure he was alright. Very calmly, I brought him to our seats and checked if he was alright. I went to the order counter and the staff replaced the ice cream for us. I asked Aiden how he felt when he fell, and he said he was scared. 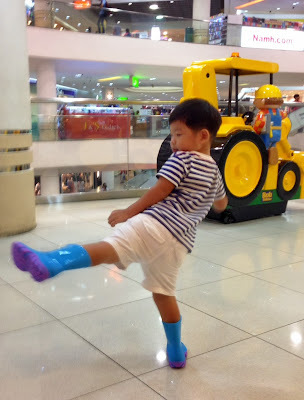 I asked him why and upon prompting, it was because he was afraid he would be scolded. I took the opportunity to explain to him that when he fell, I was worried if he hurt himself. And that this was an accident and wasn't his fault so he wouldn't be scolded. I also explained that food can always be bought again but it is important to make sure that he is not hurt. He seemed comforted and enjoyed his food. It made me feel good about myself as well, as I have seen too many parents screaming at their kids when they spill their food. I always looked at them in disbelief (even when I wasn't a parent myself then), as the poor kid was already scared and embarrassed, and their parents had to add to that by amplifying the incident. 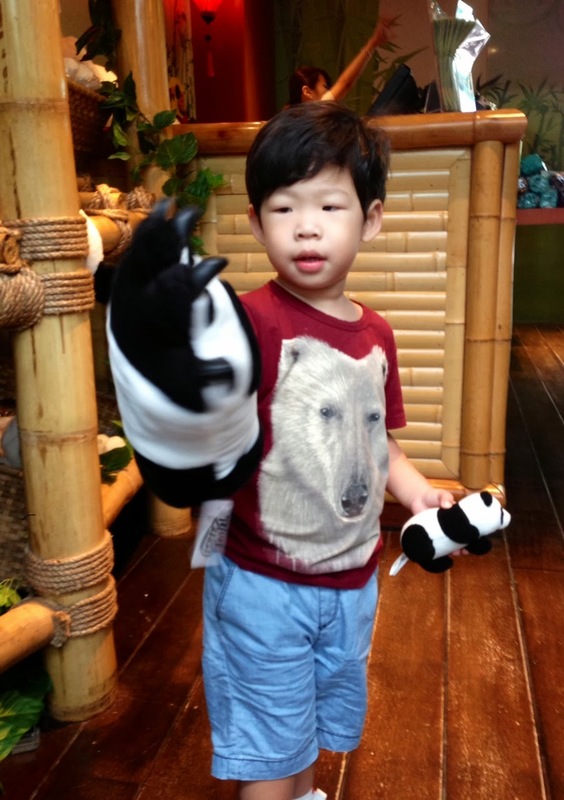 Since two haircuts ago, Aiden has been really brave and cooperative, not whining or crying at all. Today, just before it was his turn, he got anxious and his eyes turned red, and he said he didn't want to cut his hair. I spoke with him and comforted him before he agreed to sit through the hair cut, with me holding his hand. Is this him exhibiting traits of a baby again with the arrival of his baby sister? I hope he'd cope well with her joining our family in a month's time and we have been prepping him for it along the way. As a full time working mum, whenever your child falls sick and can't go to childcare, it will be a crazy day. 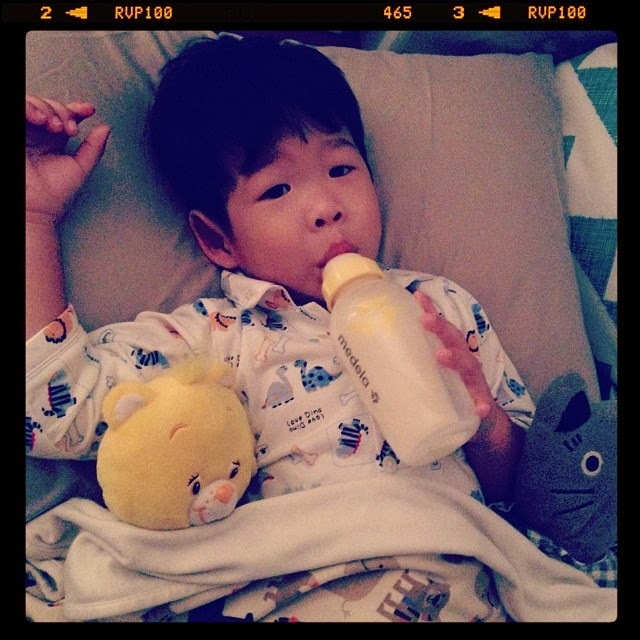 Aiden was down with fever, cough and runny nose last week, and he was too sick to go to school. The night before, this boy couldn't get to sleep with a stuffy nose. 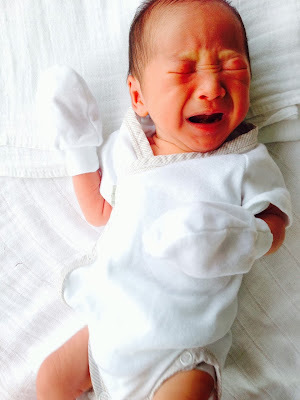 When he finally did after midnight, I went to my room but woke up at 2am and 4am to his cries and whining. I ended up not sleeping much, attending to him, sponging him to keep the temperature down and I squeezed myself on his bed as it was too much hassle going to and fro my room to check on him. 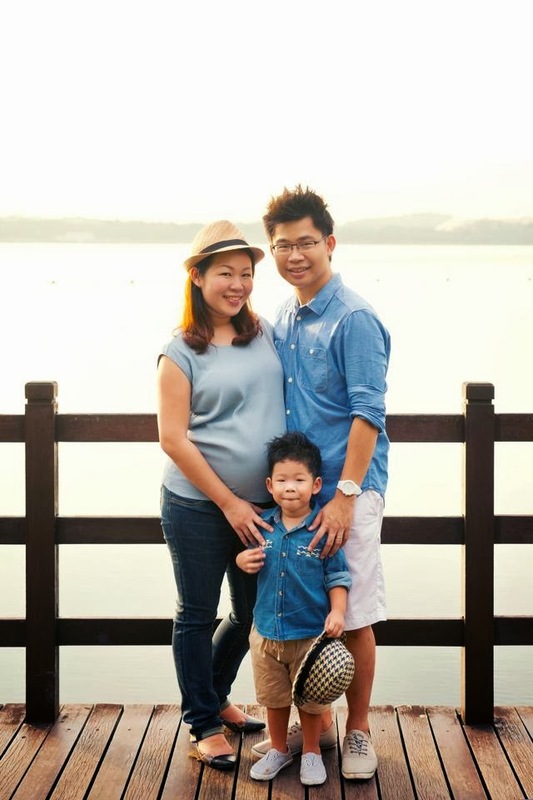 At 32 weeks pregnant, it was really an uncomfortable night for me. I applied for urgent leave on Wednesday but had to settle a few outstanding issues at work before I can go. Lugging Aiden along, I went to office to sort out the issues and took my laptop home to work & prepare for a conference call the same afternoon. Since we are out in town, I ran a few errands, brought this sick boy to an indoor playground which helped lower his temperature after sweating it out. And it was a rare occasion the two of us had lunch on our own, before heading back home. Back home, the boy became so hyperactive he got on my nerves as he should be napping after his medicine to get better. After much persistence from me, he finally fell asleep but woke up within an hour! I couldn't get much work done, so I was pretty harsh on him to return to bed - great job here as he slept 3-6pm while I squeezed in as much work I can. The next few days, I returned to work but was down with sore throat, cough and flu. It's such a terrible feeling and my ballooning belly is not helping either as I feel aches from walking. Let me get better soon, I do need the energy for this last few weeks before Ava arrives. 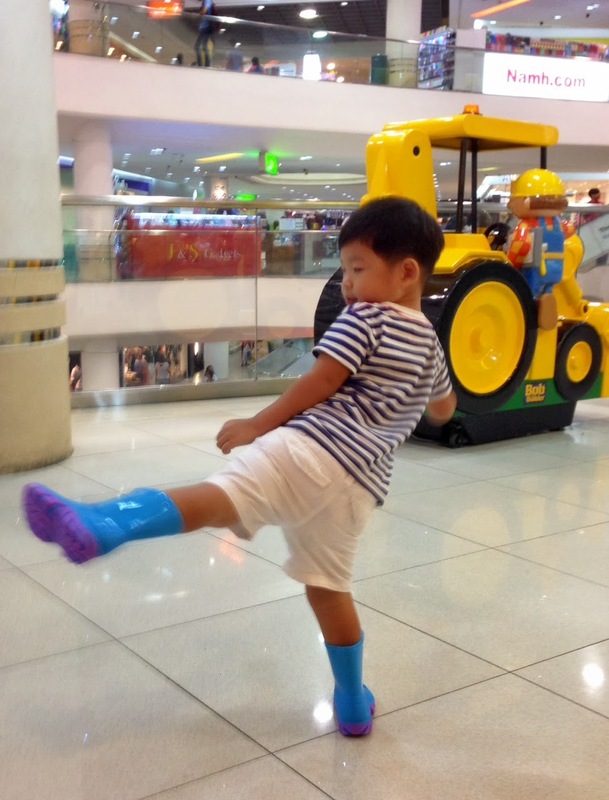 Keeping toddlers entertained, without using iPhones! A couple of weeks ago, we finally found a pocket of time to bring Aiden to a nearby park (in between a photoshoot for the new arrivals at PriviKids and shopping for furniture for the baby room) to test out the top speed on his scooter. Unfortunately, with just a road separating us and an afternoon of fun, what greeted us was a thunderstorm that came so suddenly! We ended up getting stuck at the void deck of a HDB block, with no where to go and limited dry floor space to scoot around. Luckily, Mummy Cher had the foresight of bringing along bottle bubbles and we ended up having so much fun at the gloomiest of places. As you can see, Aiden didn't cared that he looked absolutely ridiculous (and perhaps overly cautious) playing with bubbles while wearing a helmet. And that got me thinking. 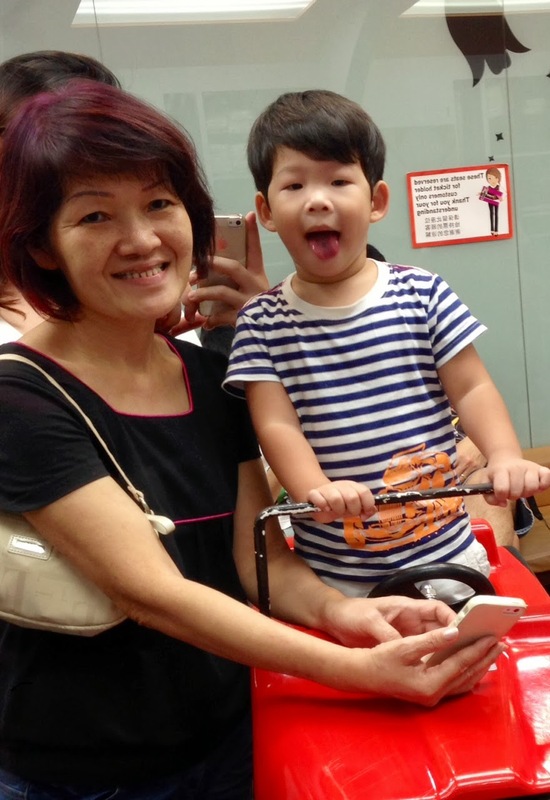 In times where many parents readily hand over the iPhone/iPad to keep their toddlers entertained, is there a better and equally convenient way to do so without the use of any electronic device? 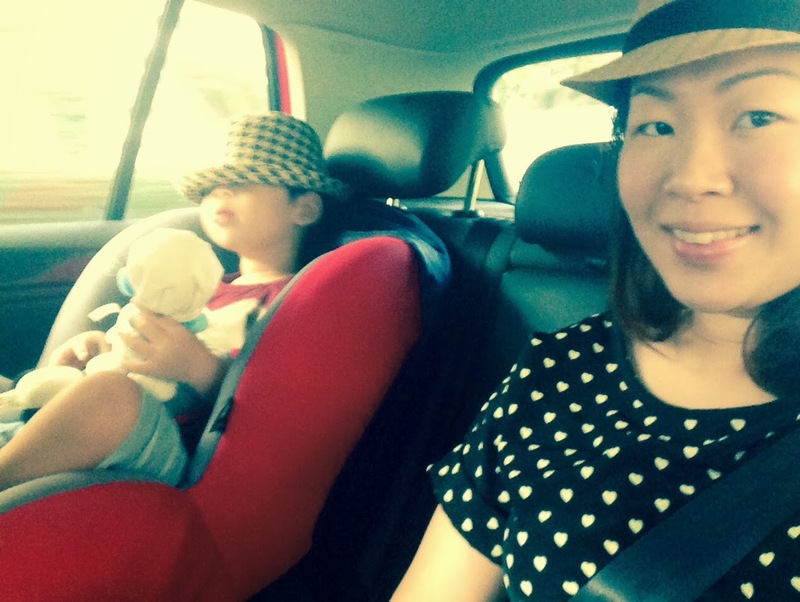 I ended up with 5 essential things that can be packed into baby bags for every outing! Kids just love chasing bubbles and trying to burst them. If there's enough space, you can do the blowing while moving around and your toddlers will get a good workout chasing the bubbles without even realising! Just make sure that the bottles are sealed/closed properly when not in use. You don't want the soapy water to leak out! Light weight, easy to keep and cheap to buy, stash a few pieces of stickers into your bag and surprise your toddler when they get restless. They will have lots of fun practising their fine motor skills (i.e. peeling and pasting) and you can also get them to talk through their choices (of which ones to remove and where to paste them). Let's face it. Digital photos rarely get viewed again after being taken, and digital paintings done on iPads seldom gets printed out. Artwork done by your toddler with crayons and paper is more likely to be remembered and treasured, even though it would not look as polished than one created with an iPad app. You will see and feel every stroke made with the crayon very clearly and it makes a fantastic item to paste in your work cubicle to remind yourself of your precious little one! Toddlers just love repeating stuff (it helps them to absorb), and when it comes to their favourite storybook, they just can't get enough of it! Seriously, we have lost count of the number of times Aiden has asked us to repeat the story of The Very Hungry Caterpillar! And he enjoys the story every single time! We reckon it's a better way to bond with your child by reading a story to them, compared to having them listen to a pre-recorded audio book. Last but not least, this is something that you can pack in unlimited amounts. 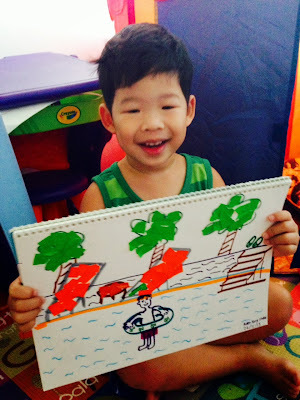 Just use your imagination to think up mini-games to occupy your toddler! Turn the void deck into a racing strip, or a shootout with hands as imaginary guns. Take turns to improvise on lyrics to their favourite songs (we love Aiden's rendition of the Bob the Builder song - Daddy daddy, can you fix it! Aiden aiden, yes I can!). Anything is possible! So, try to leave your electronic devices in your pockets and bags the next time you need to entertain your toddler! Have fun! Being a mum to 32 month old Aiden, there are so many things I amaze myself since becoming mummy and also so many things I learn and experience. 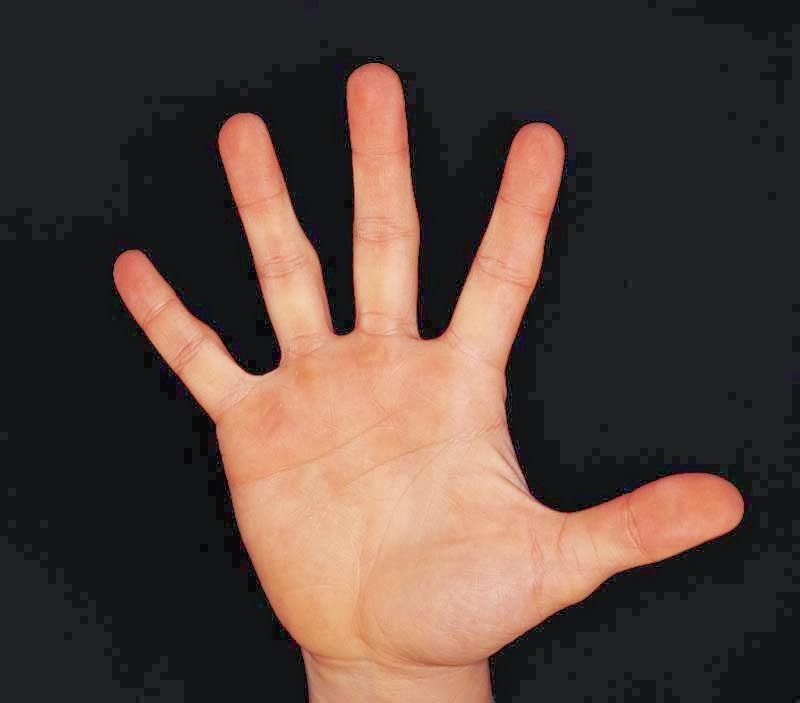 Are these familiar to you? 10% discount on De Hygienique's cleaning services! To enjoy the promotion, appointment bookings must be made by 30th November 2013. Please inform their Customer Service when booking the appointment that you got to know about De Hygienique through our blog. People who have been to our house would usually comment on how neat and tidy it is. They are being kind though, as I may be closer to having the obsessive compulsive disorder than just being neat. But I have to admit, that when it comes to the cleanliness of my mattress and sofa, these are just about the tools I am armed with since moving into our new place in April 2012. 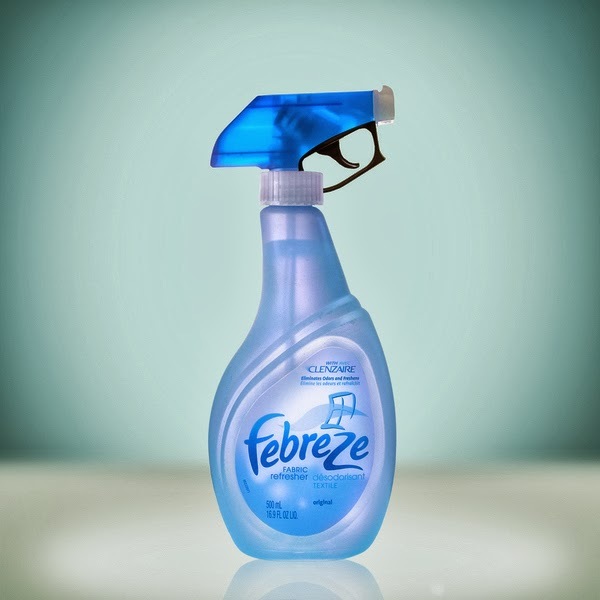 Just spray and tell yourself that it's clean. Frankly, all Febreze does is to mask the odour and give you the impression of cleanliness (read about the dangers of Febreze). And there's only so much your hand can do to dislodge dust by slapping on things, unless of course you are some martial arts expert, or Ip Man. 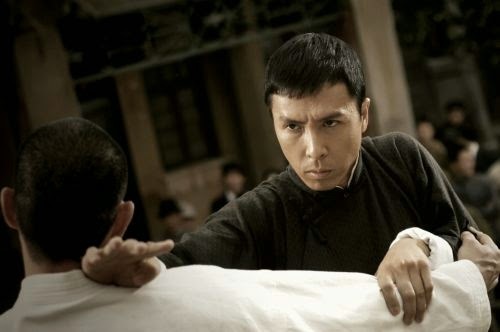 Ip Man's patented cleaning technique to achieve whiter whites. 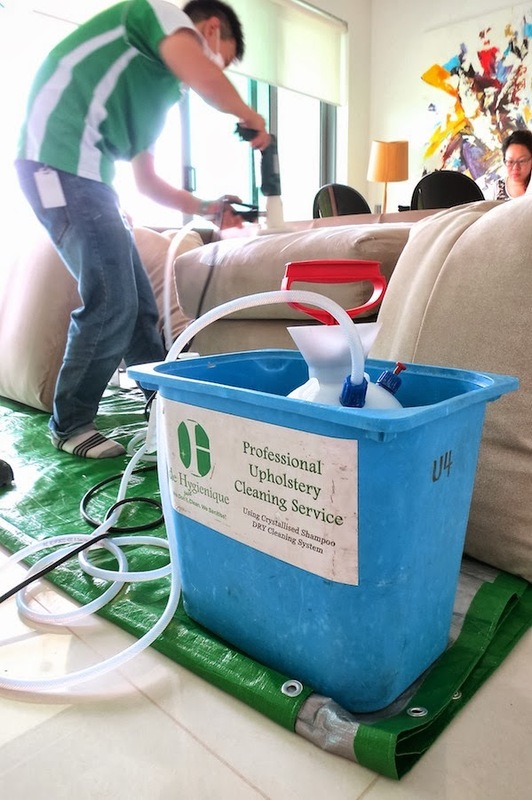 So when De Hygienique approached us to give their cleaning services a go in exchange for a honest review, we gladly welcomed them into our house! 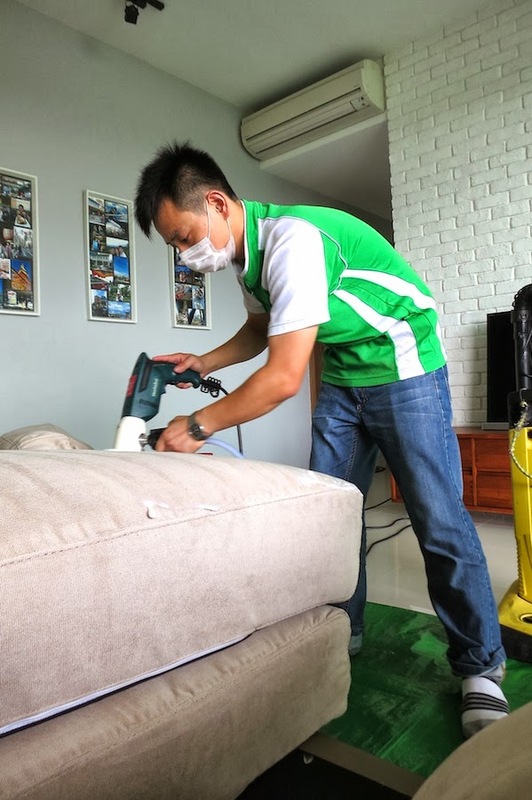 De Hygienique is Singapore's leading soft furnishing cleaning service provider, specialising in cleaning and sanitising of mattress, carpet/rug and upholstery. They are the first professional cleaning service provider in Singapore to introduce soft furnishing cleaning treatment using 100% dry, or low moisture, and chemical safe cleaning technologies from Europe. First impressions were good, as they arrived 10 mins early for the 9 to 11am time slot. I'm sure many of you would have experienced service providers that arrive late for your bookings, leaving you frustrated as your other appointments for the day would have to be pushed back, or worse, cancelled. So I was really pleasantly surprised to have them arrive and ready to start at 9am sharp! However, their bookings are open from 9am to 6pm, Mondays to Saturdays, so I was a little disappointed to not have the option of choosing weekend nights. That would really help many dual-income families like ours. I was told by their Manager that they would send at least a team of 2 to each booking to ensure maximum efficiency. Their training was very apparent too, as each step of the cleaning process was smoothly performed with no waiting around. I didn't want to deliberately slow them down so that I could observe the actual service experience and I have to say that I almost didn't have time to take enough photos! The Manager also mentioned that they would conservatively estimate the service duration based on the extent of the work, so that they can keep to the time slot communicated to customers. For our session, they were super efficient (even with me buzzing around taking photos) and were done cleaning our 2 mattresses and 1 sofa in just 1 hour. That to me is how service providers should be - under-promise and over-deliver! I was impressed with the product knowledge of the Manager. He was able to explain in layman terms exactly how each step of the process contributes to the overall cleanliness of the mattresses and sofa. I've had other service providers who would just go through the motion not knowing why they are doing what they are told to do, so De Hygienique's professionalism really impressed me. No wonder they have been in the cleaning business since 2003. Citrus spray to combat dust mites. Tracking stickers provided so that you know when the last service was. Thoughtful! What I also appreciated was the honesty of the service. The Manager did not mind telling upfront that the puke stains on my mattress (thanks to Aiden) cannot be removed by their system (luckily it gets covered up by bed sheets anyway!) and while deep sanitising of my fabric sofa will be achieved, the system will not be able to remove all stains. His honesty put me at ease, as frankly, my main objective is having a well sanitised home rather than one that only looks clean. I will not bore you with the technical details of the service (you can read about it at De Hygienique's website), but it is obvious to me that their cleaning system does exactly what it says it does. The mattress cleaning system thoroughly removed embedded dirt, dust particles, dead skin flakes and effectively eliminated microorganisms and allergens. Just look at how much rubbish it picks up on our bed after just 1 minute of treatment! Shocking that we are breathing in all these day in day out! 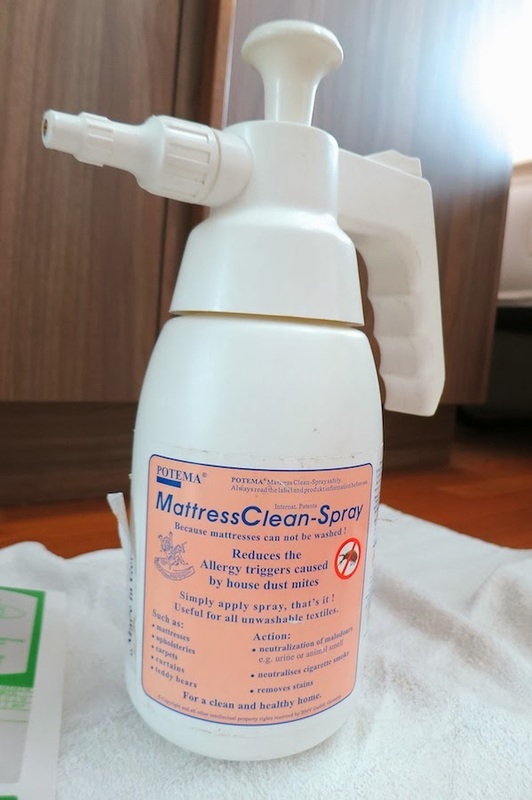 They call it a system as they also use an in-built UV-C light that was specially designed for the purpose of disinfecting the mattress, as well as a chemical safe solution (sprayed on the mattress) that will help delay the re-infestation of dust mites. The best part is that the system is 100% dry, so there is no downtime at all (how many of us are lucky enough to have spare beds in the house?)! Aiden's stuffed toys getting some sun while the bed is getting cleaned. 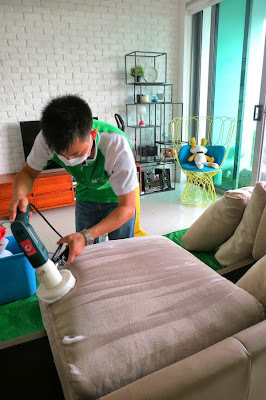 For the deep cleaning of our fabric sofa, the cleaning treatment included the thorough vacuuming of the sofa set to remove embedded dust and dirt particles, shampooing of fabric and sanitisation to eliminate bacteria and allergens. In order to achieve deep cleaning, low moisture shampooing is used, so you would have to wait a couple of hours (and have good weather on your side). Ours took almost 4 hours to dry though, but I suspect it was due to the rain outside (and a really dirty sofa that needed more shampoo!). Starts with some serious vacuuming. Time for the shampoo. They are careful not to dirty your place. Low moisture shampoo means minimum downtime. Happy Aiden = Happy us.